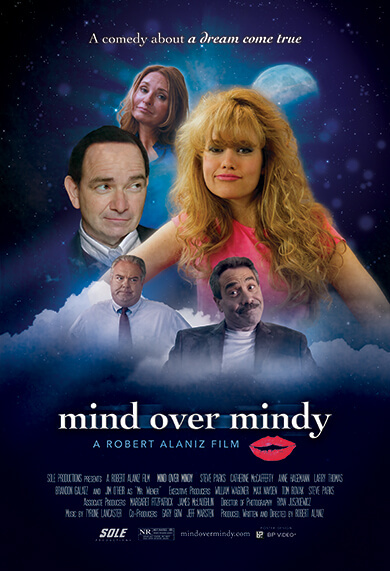 "Mind Over Mindy" | A comedy film starring Larry Thomas and featuring Jim O'Heir, written and directed by Robert Alaniz. "Mind Over Mindy" available on DVD in November, 2017! Continuing down the path of intellectual and controversial subject matter, as in his two previous comedies, D.I.N.K.s (Double Income No Kids) and You Don’t Say!, writer/director Robert Alaniz’s latest comedy Mind Over Mindy addresses the issue of regret and how living in the past can ruin the future. The cast includes Larry Thomas (the Soup Nazi on Seinfeld) in the role of the schizophrenic therapist Dr. Fischer, and features the very funny Jim O’Heir (“Jerry” on NBC’s Parks and Recreation) as Mr. Weiner, the general manager of a car dealership.